22mm x 26.3mm 18K white gold case set with 88 diamonds (~0.71 ct.), eternal gray dial with diamond hour markers and gold applied Roman numerals, quartz caliber E 15 movement,. Water resistant to 30 meters. 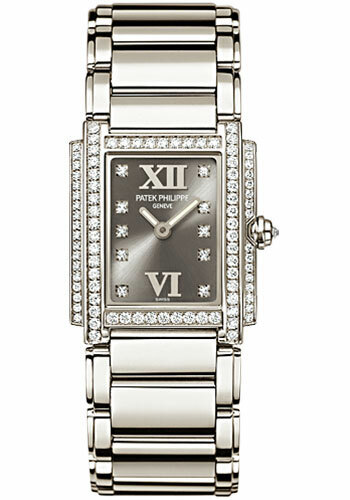 22mm x 26.3mm 18K white gold case set with 88 diamonds (~0.71 ct.), timeless white dial with diamond hour markers and gold applied Roman numerals, quartz caliber E 15 movement,. Water resistant to 30 meters. 22mm x 26.3mm 18K white gold case , case and back set with 192 diamonds (~0.91 ct.), diamond set crown, diamond paved dial with 147 diamonds (~0.63 ct.), manual winding caliber 16-250 movement, approximately 38 hours of power reserve, 18K white gold bracelet 1128 diaonds (~6.74 ct.). Water resistant to 30 meters.